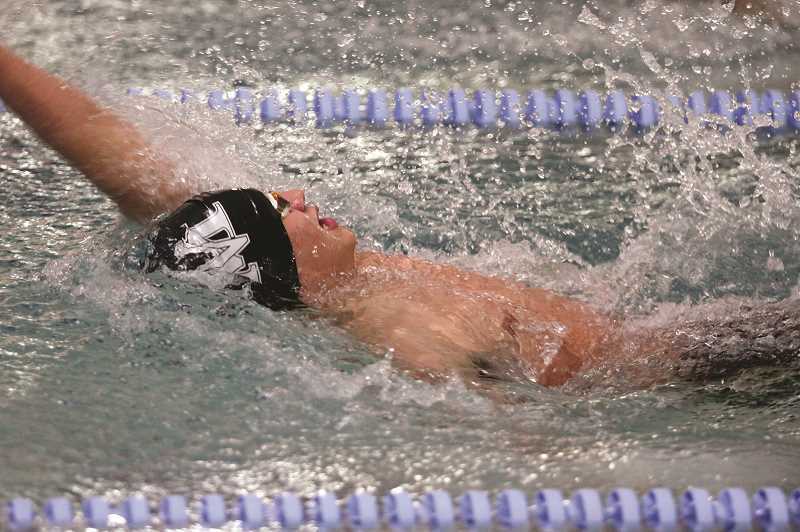 The North Marion swimming program celebrated its senior athletes on Thursday, hosting the Gladstone Gladiators at the Woodburn Aquatic Center for a dual meet as the regular season comes to a close. With 11 seniors on this year's team, North Marion head coach Teresa Chan-Chaddick is blessed with one of the biggest influxes of athletes that the swim program has seen in years. "For a school of our size, that's unheard of," Chan-Chaddick said. "I think it helped that I taught 10 out of the 11 seniors when they were in third, fourth and fifth grade." The Huskies were buoyed this year by four-year swimmers Jason Cano, Pascal Powers-Leach, Ann-Elise Lader and Sophie Davenport. 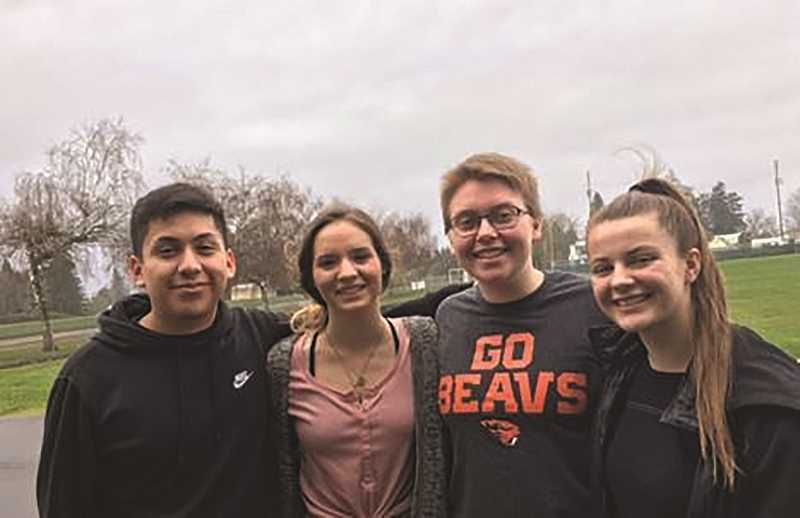 Along with fellow seniors Jane Orr, Mauricio Verastegui, Shane Kacalek, Caden Grigorieff, Damion Railey, Darian Davenport, Sophie Davenport and Logan Grabill-Brown, and the team was practically bursting at the seams trying to find enough time in the pool and with coaches at practices. In total, the North Marion swim program welcomed around 40 athletes this year. "It was challenging," Chan-Chaddick said. "There's multiple ability levels and one pool space. I didn't anticipate that many would actually show up. The pool space is one of the biggest things, because we have to reserve the lanes way before I knew the numbers." But the limited space didn't hamper the positivity coming out of the program, where swimmers line the sides of the pool at meets cheering on their teammates. As Chan-Chaddick juggled the administrative and personnel side of coaching, team captains Powers-Leach and Verastegui provided stability from within the team. "They've been amazing, just very helpful," Chan-Chaddick said. "They try and do what they can and help out with the newbies and also me." As the team looks ahead toward the coming end of the season, the Huskies are still figuring out where each swimmer is going to going to compete. With each swimmer only being able to compete in two individual events and two relays (or one individual and three relays), Chan-Chaddick is working with her swimmers to figure out where they want to compete and balance that with where their opponents are likely to compete. With the goal of getting as many North Marion swimmers to the second day of districts and challenging for a trip to the state meet, it's a delicate balancing act that will be decided in the final week. "We've got one more meet at Sweet Home, and that will really help the athletes and myself a better idea of where they would like to swim," Chan-Chaddick said. "I try to let the kids pick and choose, but at the same time, I try to walk them through whether they can get to the second day of districts." The Huskies will finish their regular season at Sweet Home this week before traveling to South Albany High School for the District Championships on Feb. 8-9.